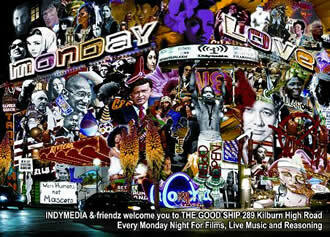 Monday Love is a weekly film & music night to inspire, inform and inebriate at The Good Ship on Kilburn High Road, NW6. I’ve had Monday Love twice now as an antidote to my current, drab, corporate nonsense of a 9 ‘til 5 existence. No inebriation is required. Indeed, this is a weekday night for those who have grown tired of the selfish Saturday shop ‘til you drop and mortgage mortuary to see a bigger picture - or a better picture - than the dollops of dross spoon fed to the masses by Hollywood. The well attended launch night on January 8th showed two films highlighting two different subjects - the US media’s portrayal and betrayal of Iraq and, Steal This Film. This is a tale of Scandinavian youth, pirating films and beating Hollywood and the White House. A second Monday Love highlighted our climate chaos. There we were waiting for the award winning, End of Suburbia (about oil depletion and the collapse of the American Dream) when we experienced the collapse of the DVD player. So two musicians and yours truly entertained the troops, including a couple of rows of very quiet Asian people perhaps expecting films from South Korea set for the following week! There then followed Penny Cole’s interesting talk and Q & A session on climate change and A World To Win’s solutions to the problem set out in the new book, Running a Temperature. How did Monday Love come about? East London, and then began to grow at a quiet meeting in a bar in Portobello Road in the fall of 2006.
Who are the key players putting the night on? Euan Donaldson (Filmmakers Against War & London Indymedia), Zoe Young( London Indymedia & IFIWatch.tv), Smallmoney (Spiritualkids), ResidentDJ Carlos, & VJ Arun, & The Good Ship pub. What are the aims of Monday Love? To bring the Indymedia project to a wider audience and to create a regular weekly place for activists, political filmmakers, campaigners to come and meet, network, chat & chill. What do you make of the political situation today? What effect do you think ‘Monday Love’ is having on people from what you’ve seen so far? Confusion, excitement and a greater respect for peace. In This World delivers a sustained, sometimes gruelling and traumatic depiction of the business of people-smuggling.